Would safely allow more power. But the controller somehow senses output current. So power would be limited to 50A regardless. 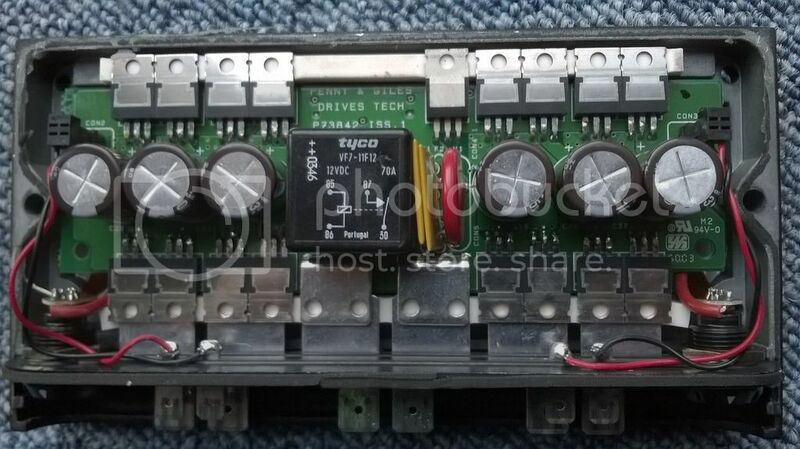 So you would need to swap ALL the power mosfets, and find the two current sensors and fool them. The ones BM linked to, or a host of others. The key parameter after on resistance, drain-source voltage and continuous drain current, is input capacitance. If its massively bigger the driving circuit might not be able to turn the MOSFET on fully/fast enough which would be self-defeating. If I was going to upgrade my controller I'd want to put a scope on it on the bench first to see the pulse timing before choosing a replacement device. Its possible there is no current limit sensing, just temperature sensing for rollback, in which case replacing the MOSFETs with ones that run cooler will increase the output capability anyway. When you set "turn rate" to 20% at max stick, by way of an e.g; thats what you get. A 20% pulsewidth to zero turn - provided motor compensation is off or set to zero. OR if theres no physical loading..
That means a motor with a stall current of 100A will only pull 20A from the battery, so the chair will not zero turn. What you actually get, if you turn motor compensation up to the correct value, is 100A even with a 20% input command (if needed), to initiate this zero turn. So *something* is definitely measuring current! Quite what, I have no idea. But there are a lot of small chips on that board that are copied on each side. No doubt one of those is reading mag field or something (hall) somewhere. Theres another issue with upgrading past 100A though. The daft connectors they use, and the way that the current is sent to the wiring by pushing the tabs against the terminals with a foam rubber strip! That would need at least bolts, and better soldered wiring. The current sense would generally be either between ground and the source leads of the MOSFETs making up the lower half of the H-bridge or in the output lead to the motor. Either way its in a high current area so unlikely to be a small component. That's why I suggested it might be the PCB track between the source pins of the lower MOSFETs and the ground bus/plane. Its easy to control the 'resistance' of that and you only need one or two tenths of a volt, so we're looking at 2milliohm. Incidentally, while perusing MOSFETs for my controller, I found some that have a built-in current sense connection; e.g. NXP's BUK7909-75AIE (75v, 75A, 8mOhm) gives a current out that's 1/500 of the drain current, so a 10ohm resistor to ground gives a 1.5v signal at 75A which makes it easy to sample with an ADC input on a microcontroller with no additional circuitry. Battery fits... Thats a work of art! Wow, that is a work of art, and coming along nicely. Will look well with that new seat back fitted. This should have an enormous range. Will will hind out in about 10 days. Seat isnt bolted on, just loose. Wires all over the place. But you get the idea. Waiting for seat, and need to build a footplate. Then ready to go. http://zoomability.com/zoom/ this gets 25 miles with just 950 watt hours. Mine isnt as efficient, as its not brushless. But I have 3200 watt hours... So should get 50 to 60 miles on a smooth pavement. fan cooled above 45 degrees C.
Battery sides will be covered in 1mm black plastic sheet, slid into the base to hide the cells and wiring. You will only see the blue ones at the front. LED 10 WATT headlamps (4x 25mm Diameter to be added) and they are as good as a car headlight, and really small! My cooling fan works, but its a bit noisy. Doesent like 24V... What resistor would I need to slow it to a sensible rate... Takes .2A at 12V. Thanks, must have one somewhere. I have a bunch of 5 and 10 watt resistors. Expresso, you missed that its on 24V! Expresso, you missed that its on 24V! Sounds like a vacuum cleaner!